Join the A55 following signs to North Wales. Continue along the A55 for around 30 miles, Exit A55 at Junction 26 signposted St Asaph Business Park and turn left onto the Business Park. Take the third exit off the roundabout, and then take the second turning on the left into Bowen Court. 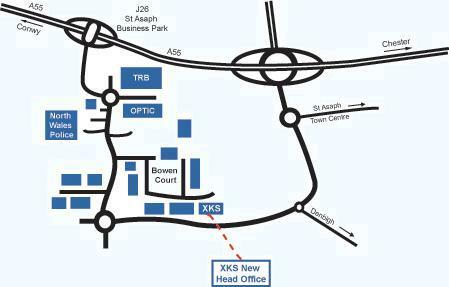 XKS is the fifth building on the right.